One of the most popular cat blogs is Catsparella, which has grown from a tiny cat lifestyle blog a year ago to rising star status. 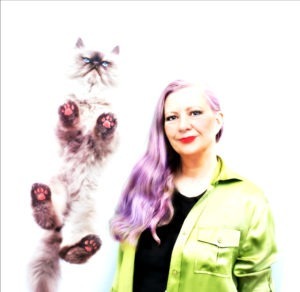 The woman behind Catsparella is Stephanie Harwin who lives in New Jersey with two cats. Invited by the Fancy Feast team to the “Storybook Cat Wedding” commercial shoot, Stephanie will be flying out to L.A. today to cover the event live tomorrow, Monday June 27. This Jersey girl also was a finalist in recent the Purina Correspondent contest. I was curious about Purina experience and asked Stephanie about the highlights. SH: The biggest highlight of the experience was going to Nestle Purina Petcare headquarters in St. Louis, and getting the opportunity to meet the entire Cat Chow team and the other six finalists. It was a whirlwind two days, and not only did we spend time getting interviewed, photographed, and videotaped, but they also treated us to some great meals, a trip to the Gateway Arch, and box seats at a Cardinals game. Also, the bathtub in my hotel room was heavenly! to travel around the country talking to people about their cats?? really paved the way for greater cat lover acceptance within society. LMW: When did you realize you’re cat person? Are you a dog person as well? exposure to cats throughout my early life. LMW: You have two cats, Charlie and Priscilla, which are your first cats. When and how did they become a part of you family, and what have they taught you about life? LMW: Do you have plans on enlarging your cat family? LMW: Where do you see cat blogging headed and specifically your blog? months, and plan to keep going and see where it leads. you most love about blogging? getting to learn about their kitties. LMW: Do you volunteer at a shelter or cat-related cause? SH: Yes, I volunteer at my local animal shelter, and plan on getting moreinvolved with cat-related causes in the future. LMW: What do you account for the growing interest in cat culture? “out in the world” meeting each other around their neighborhoods and in parks, but most cat lovers don’t have the same opportunity, so they have been able to form this great community and culture online to share all of their cat stories, pictures, etc. in a way that was never possible before. Visit Catsparella, the Pop Culture Pussycat, All Cats. All The Time. Any time. Hey what fun! We like Catsparella too. What a good interview! We enjoy reading Catsparella! I had the pleasure of meeting Stephanie at a Pet Writer’s Conference in NYC this past February. I was the one wearing all leopard and she was the one in an adorable grey dress with a chic kitty on it! From that moment, I knew she and I would “click”! Stephanie is a very unique, creative, intelligent, stylish, and hip young lady who shares all things cats with enormous love, talent, and individuality. That’s why I love her blog – her posts and commentary are always cutting edge and so current with the changing times. Great interview! Stephanie has such a unique angle and her blog really stands out among cat blogs. I can’t wait to read her report from the Fancy Feast commercial shoot.